The festival of colours is here and just like every year you are excited to play holi with your family, friends and loved ones. However, there are few precautions you must take from a health point of view before letting your hair down & enjoying yourself in this festival. During early days, colours used in holi were naturally prepared and also had many health benefits. This includes extracts from turmeric, tulsi, neem, rose, hibiscus and other prominent plants that come with rich healing and skin benefits. Over the period of time, synthetic and artificial colours have come into the picture. The reasons being they are made from chemicals and can be manufactured on a large scale. They are also inexpensive and can be prepared in a very short span of time. These colours are CHEAP in the literal sense and will do only harm to your health and skin in particular. You will have a tough time removing these colours off your skin & also feel dehydrated and low after a few hours. This is because the chemicals ingested in your skin are harmful toxins and the body needs ample amount of time to flush these toxins out of your system. 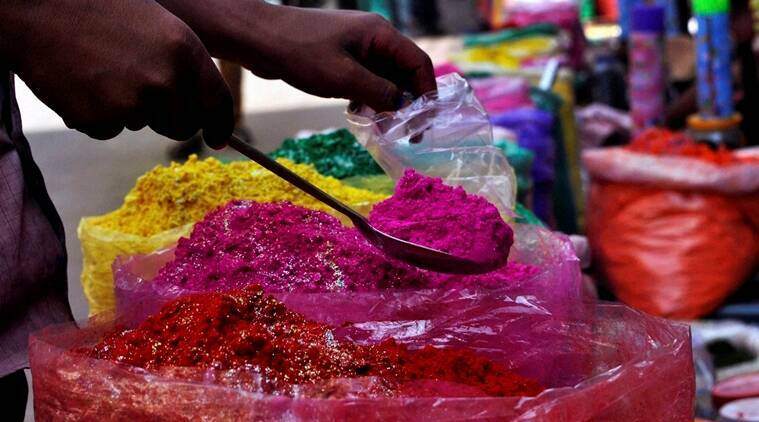 The culprits for these are the chemicals in the artificial holi colours. Causes : Skin cancer, loss of eyesight, loss of memory and partial paralysis. Causes: Asthma, dermatitis, skin allergy. Purchase and use only organic, herbal or eco friendly colours. Purchase colours from a trusted source that sells colours in packets that clearly mentions its contents and other quality measures. Smell the colours before purchasing. If it smells similar to petrol, diesel or any other known chemicals then refrain from buying it. Check the thickness of the colour either by rubbing it on your hands or putting it in water. Colours that contain chemicals and metals are highly insoluble in water. Red (Gulal) is still one of the most widely used colours and is also available free from any colours. Stick to using this colour only. STAY SAFE. USE NATURAL & HERBAL COLOURS. Previous articleWhen Should You Drink Water?